Some horror stories stick with you for days; while reading you can’t tear your eyes away and later on images persist when you’re trying to get to sleep. When I was six or so, I remember being so terrified of the Goosebumps book The Haunted Mask that I put it on the floor of my room with a plastic table turned upside down on it. When I read Lunar Park by Bret Easton Ellis as a teenager, I reached a terrifying point and knew I had to keep reading or I wouldn’t be able to sleep. I ended up finishing it at 5am without experiencing a moment when I wasn’t afraid. This book was the subject of many nightmares for me. So when I took Uzumaki to read on the train, I was pleasantly surprised to find I couldn’t stop staring in horror at the pages. The most direct translation of the word “Uzumaki” is “Spiral”, although it refers more to a three-dimensional spiral, like a vortex or a whirlpool and just like the secret shape of the universe, Uzumaki draws the reader helplessly in. The deluxe edition was printed in 2013, and stands out on the Travelling Man shelves as a rather imposing beast – matte black on the front and back with faint images from the story while the two inch thick spine shows a wide-eyed and stitched together corpse. 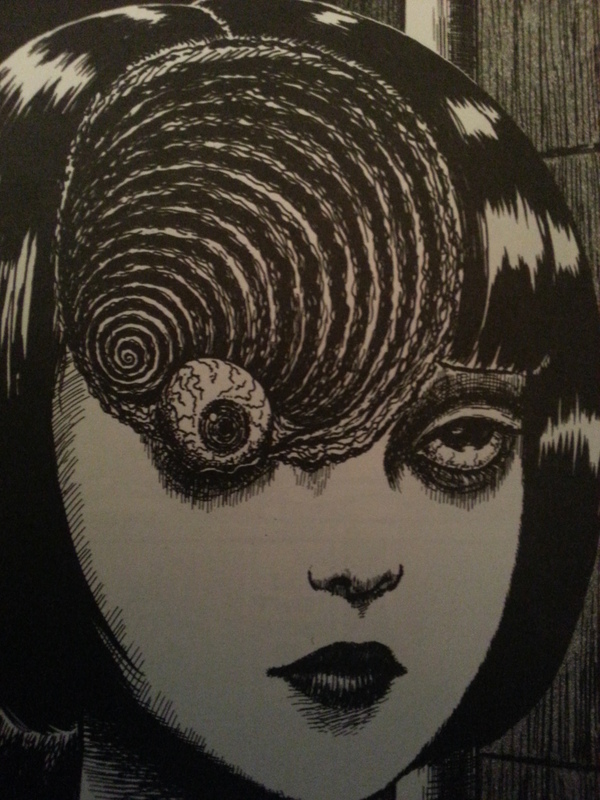 The horror manga, written and illustrated by Junji Ito, was first serialised in Shogakukan’s Big Comic Spirits in the late nineties, a magazine designed for young adult men. It was later published in Viz in England, re-released in 2007 and last year had its omnibus hardcover deluxe edition. Ito is most famous for his manga Tomie, about an immortal girl who drives the people around her into an obsession so fierce they end up killing her, but also wrote Gyo, the story of mechanical sea-life carcasses controlled by a “death stench”. 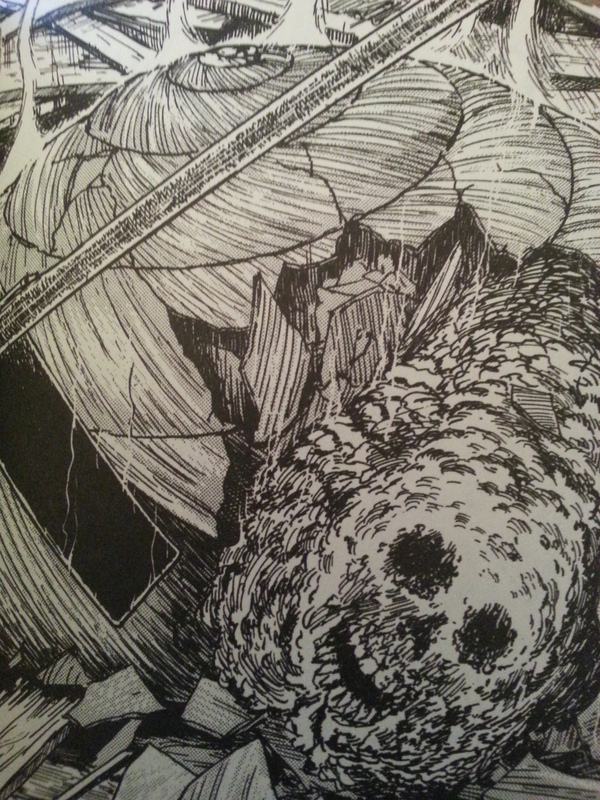 Some popular themes in his work include body horror, breakdowns of society and the inability to escape one’s fate. The horror builds up slowly and insidiously in the isolated coastal town of Kurôzu-cho. Most of the stories are focussed around a young girl Kirie and her boyfriend Shuichi, who goes to school in another town. When Shuichi’s father first becomes obsessed with the spiral, it’s destructive but it’s all in his mind. He begins seeing them everywhere, in many patterns, but it’s much more terrifying when his wife starts to notice spirals on her own body and on others; determined to eradicate the pattern which haunts her, she cuts the tips from her fingers, shaves her hair off, and eventually becomes her own undoing when the image of her dead husband as a millipede tells her about the spiral in her ear. The moment Shuichi sees the organ of Corti on a medical poster this feeling of intense dread descends and we know it’s only a matter of time. The ironic tragedy of it? That by damaging her inner-ears, she is trapped forever in the spiral of vertigo. Moments in this book go from genuinely tragic, to hilarious, to disgusting almost instantly. As the town begins to succumb to the spirals, so to do the residents, some of whom begin to transform into gigantic snails and lose their humanity – it’s a Kafka-inspired piece of body horror which is absolute perfection down to the way he draws the skeletal snail-humans’ faces. When the townspeople become trapped and begin to run out of food, they see the snails as a preferable alternative to outright cannibalism. 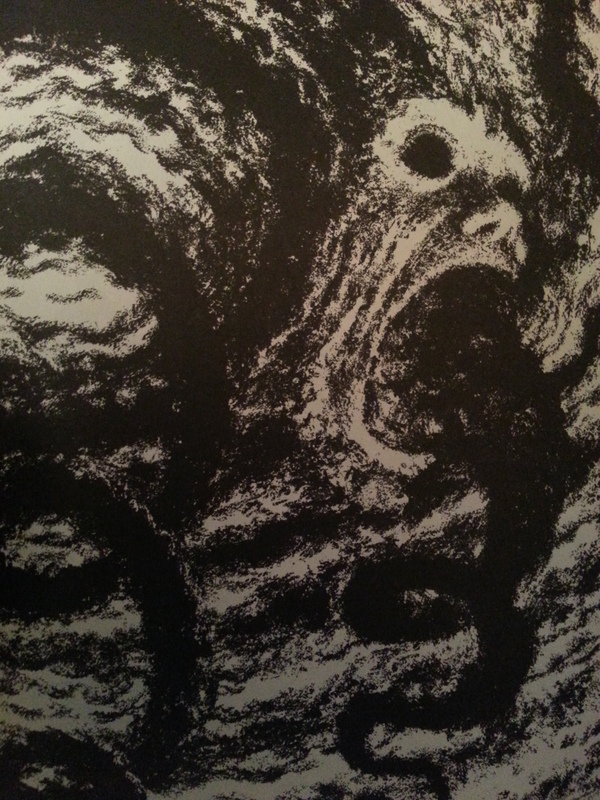 The spiral is impressively doled out throughout the story – it begins to appear more and more in the background, not just in spiraling clouds but in wood patterns, hair styles, umbilical cords, sirens and whirlwinds. The way the stories build up slowly gives it the same kind of feeling as MPD Psycho or the X-Files TV series, starting as monster-of-the-week style storyline which evolve into a huge story. It gives the reader a sense of inescapable horror; we keep falling deeper and deeper into the spiral, unable to look away and unable to change the end of the nightmare. The actual town of Kurôzu-cho is comparable to Buffy’s Sunnydale, where so much of the supernatural is able to happen before people will believe something mysterious is going on. Kirie and Shuichi are in the privileged position of knowing what’s going on before anyone else, but are still unable to escape in time because of the pull of their friends and family, so we watch them fight off the terror with knowledge for a while. Kirie and Shuchi’s relationship is one of those pure manga loves, like that seen among the young couples in Battle Royale; that kind of unquestionable love and commitment that keeps them together until the end. I could go on for hours about the various horror elements – it’s a big manga, with a lot of dark stories packed in. It’s sometimes ridiculous, usually surreal and in terms of artistic style it’s like a combination between Akira, Pet Shop of Horrors and an M.C. Escher piece, with a really astounding amount of detail and texture. The first few pages of most chapters are coloured in a simplistic watercolour style of paint which is incongruous with the charcoal blacks of the rest of the book; it’s kind of pleasantly jarring, if such a thing exists, and the girls have this wonderful Mark Ryden doe-eyed appearance. 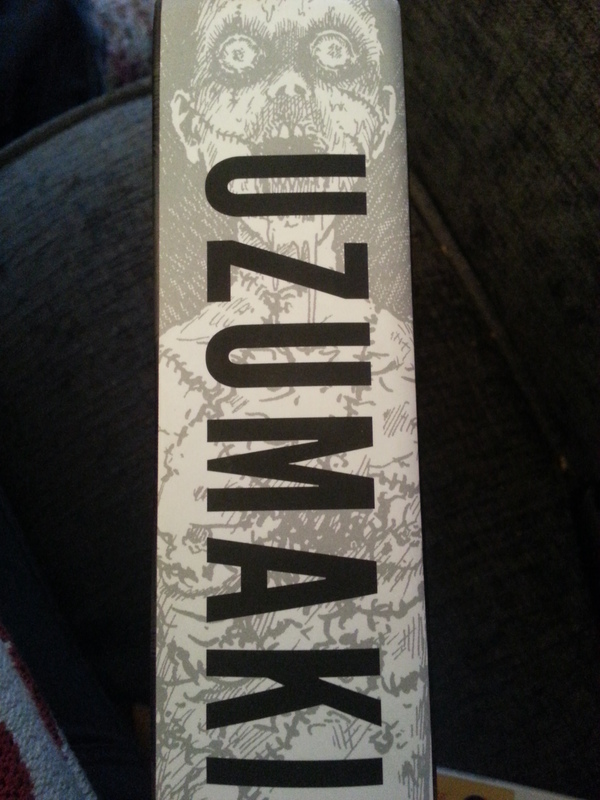 I would recommend Uzumaki to lovers of body-horror, chilling manga, Lovecraftian and Kaska-esque stories, and a slow-burning apocalypse. If you haven’t explored much manga this is a great place to start, but otherwise there is a very decent film version – albeit with a much shorter storyline and drastically different ending.